Have you ever experienced ice dams on your own home or know someone that had them? In the worst cases water leaks inside the home. About 90% of the time the leaks will occur over a window or door. leaks can also occur in the vicinity of bathroom vents and central air vents in the ceiling as well. The common element these things have is they are leaking hot air from the living space into the attic or crawl space. From there the process is simple. That heated air travels up to your roofs deck just under the shingles and starts to melt the snow on your roof from the bottom. There is a freeze and thaw process that happens and that’s where the ice dams start to grow. 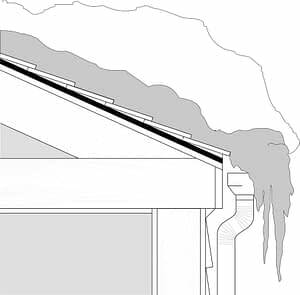 Most ice dams begin to form at the eave or in the vicinity of your gutters. In some cases ice dams start to form higher up on the roof maybe in the area of a type of vent on or under the roof. Once the freeze and thaw process starts it grows the ice dams. Soon the water cannot travel down the roof and it goes up your roof instead. Once the water starts to travel up the roof it goes under your shingles and if there is no ice and water barrier or other protection in place under your shingles the water will find a place to come inside. Most of the time Ice Dams are blamed on the gutters while certain gutters can aid in the process they are not to blame. Heat coming from inside a living space that escapes into the attic or crawl space is the reason why ice dams form. So, how do you stop it? Proper ventilation, Having the correct amount and type of ventilation on your home in regards to your soffit / eave vents and your ridge vent make all the difference. But, it has to be free flowing and not blocked by your attic insulation. Attic insulation that is pushed into the eave area will not let the cool outside air into your attic and stabilize (or cool) temperatures. This can be an easy fix in some cases but, some homes need the ventilation brought up to building code. Sometimes you might have the proper amount of ventilation it’s just that your attic insulation is blocking it. Try this test, Go into your attic on the next sunny day and look toward your eaves. Can you see daylight the whole length of the eaves? If you can you have ventilation that is unblocked that’s a good thing, whether it’s enough that needs to be verified. If you don’t see daylight the air is not getting through whether you have the correct amount of ventilation or not. If water and or air is getting into the attic space mold can easily form along the eaves and eventually cause other problems like delaminating the plywood on the underside of your roof. If you would like to learn more about ice dams on your Connecticut home read our Free 10 page guide on Connecticut Ice Dams Here. 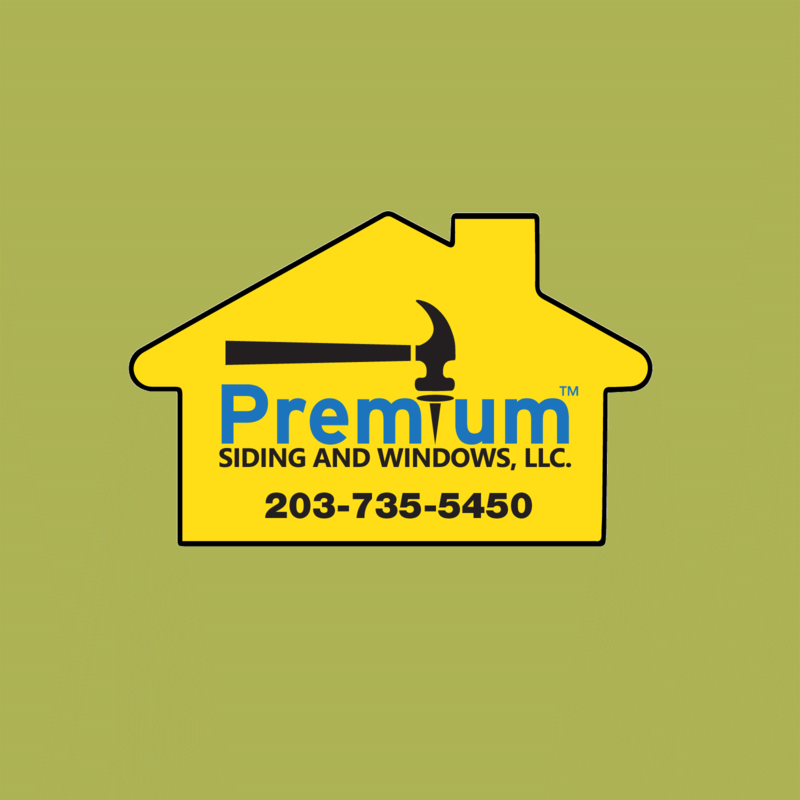 Not sure if you have any of the requirements for proper roof / attic ventilation give Premium Siding & Windows a call at 203-735-5450 or use our contact form. We will be happy to help. Most Connecticut homeowners are not aware of the tax incentives available to them when planning or completing a home improvement project. With ever increasing energy costs, these incentives were mainly put in place to encourage Connecticut homeowners to install better or the best performing windows, doors and insulated siding, in their homes. There are also other incentives offered from Energy Star on weatherization and other products used in the home. Having the qualified products installed can save you money upfront on your energy bills and later on your taxes. If you are thinking about renovating your bathroom, redecoration and painting probably can come to your mind. These are just a few things that you can do and there are others that you may likely consider. Roxbury bathroom remodeling adds value to a home. Whether your goal for the renovation is saving money or environmental responsibility, properly remodeling your bathroom can make you feel satisfied. For many people, the bathroom is their place of solitude, hygiene, relaxation and health. If you are just in search for some affordable improvements, consider your bathroom space and storage. You can look to the cabinet space and think if you can add shelving. Is it hard to reach the towel? Is it so cold in the bathroom or do you lose things within the closet? These are just a few things that you can easily tweak for a little investment shopping on a weekend at a Roxbury home improvement store. If you’re are thinking about changing your bathroom’s infrastructure, some good projects to complete are the floor tile, counter-tops, wall tile and fixtures. A few things you may consider in making changes are trend and longevity. It is enticing to go with what is new during renovation venture but keep in mind that a trend will always be a trend. Having a bronze colored faucet is a good idea but if you do not feel like redoing this kind of Roxbury bathroom remodeling project once every ten (10) to twenty (20) years, opt for standard choices that have trendy accents. You may wish to go for a neutral counter-top with a selection of wood that can last long while accenting it with bronze fixtures. You can also change things like knobs, faucets, mirrors and paint colors to make your Roxbury bathroom looks different and have a new feel. The floor tiles and cabinets must be selected for longevity. If you have much time and budget, you may fully remodel your bathroom into a luxurious one. You may have your lavatories mimic those that can give you spa like experience with relaxation elements, steam rooms, heated floors, cascading water fixtures, jet tubs or perhaps a geometric shaped window to add some class and elegance. These are just some Roxbury bathroom remodeling ideas that you may want to consider. Whether you have little or more time, much or tight budget, you can always find ways to remodel your bathroom and have the kind that will surely add beauty to your home. Here we are October 2013 and the leaves are falling all over Connecticut and into your gutters and downspouts too. We make no secret that we are in the gutter guard business. The reasons why we sell gutter guards in Connecticut is for the simple reason that you can’t clean your gutters enough and that great gutter guards like Mastershield will end gutter cleaning for you, Permanently. When it comes to gutter cleaning how many times a year and when is appropriate? Well take this time of year, leaves are falling now, it rains tonight and your gutters are clogged and overflowing causing problems you may or may not see, yet. If you wait a few more weeks to clean them they are even more full or frozen then no one is cleaning them. The same thing happens in the springtime, it’s May 15th your gutters are clean here comes the next day, a big rain storm with wind and yes, your gutters are clogged. You have to remember it doesn’t take a lot of leaves to cause a problem. If your paying someone to clean them and keep them clean, 2 or 3 times a year won’t do it. If your cleaning them yourself after the 6th or 7th time it probably isn’t fun anymore. Also keep your safety in mind, falling even 6 feet off a step ladder can hurt you seriously. I would also like to mention that Mastershield can be heated to help prevent ice dams. A nice option to have on your whole house or areas of your home you would like protected. Contact us today for a Free, Fast Mastershield estimate for your home. We service all of Connecticut.